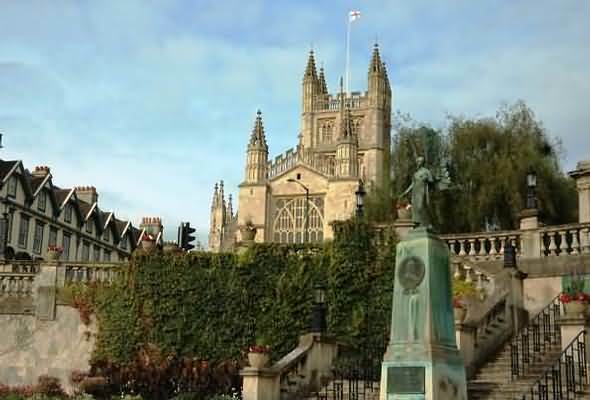 View of Bath Abbey from Parade Gardens - the Abbey was founded in 1499. 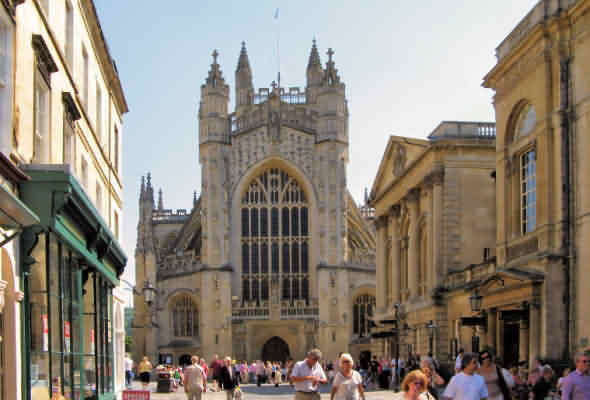 Among the many sights to be seen within the City of Bath is its superb Abbey Church of St Peter and St Paul. Built in 1611 its origins go back much further and may have been built on the site of a pagan temple. The original Anglo-Saxon church was built in 757AD but was dismantled by the Normans following the conquest in 1066AD. In 1090AD an enormous cathedral began to be constructed but is was so large that the monastery was unable to maintain it and by the end of the 15th century it was derelict. 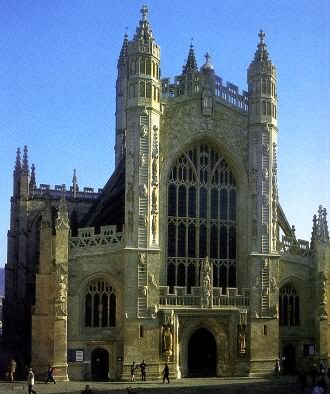 In 1499 the present abbey church was founded but some 40 years later in 1539 it was ruined following the dissolution of the monasteries under the direction of King Henry VIII. 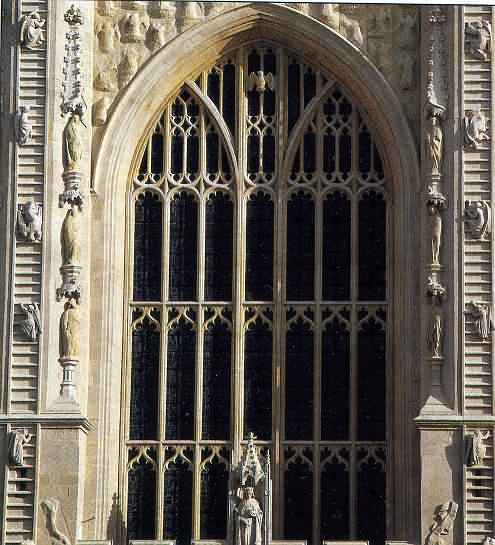 What can be seen now is mainly the work of two brothers, Robert Vertue (died 1506) and William Vertue (died 1527), they were involved in its construction and they were also credited with work on the Tower of London in 1501/1502; their involvement in the Henry VII chapel and Kings College Cambridge was for the much admired vaulted ceiling and examples of their superb work is to be seen in Bath Abbey's vaulted ceilings. 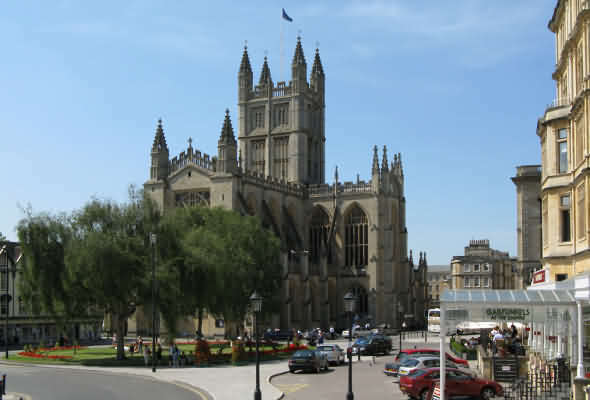 The Abbey is built in cruciform style and has a tower with pinnacles, with a seating capacity of 1200 it provides an impressive place of worship. The tower has a peal of 10 bells - a guided tour of the tower costs £6.00 for adults and £3.00 for children - aged 5years to 14years. Children must be accompanied by an adult on a ‘one to one ‘ basis. From the tower marvellous views can be seen over the city of Bath. The main organ was reconstructed in 1997 by Klais Orgelball of Bonn, Germany. The Continuo organ was installed in 1999. In the summer months visitors from all over the world are able to enjoy the many concerts which include lunchtime promenade concerts played on the superb Klais organ. 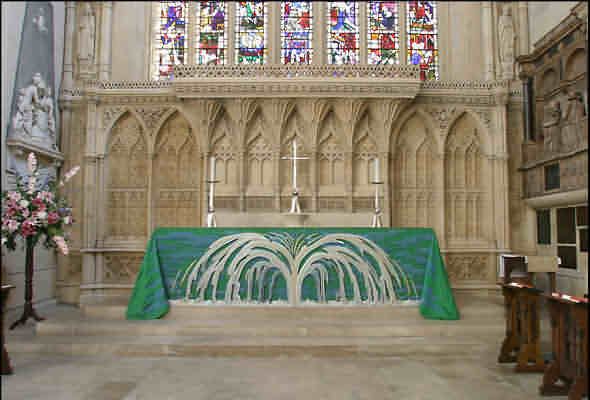 There are many memorials in the abbey. The one to Richard Beau Nash records his birth date as 18th October 1674 and his death on 3rd February 1762 and although he had a lavish funeral he was buried in a paupers grave due to his massive gambling debts. Beau Nash was described as a influential dandy and a man of fashion. Amongst the memorials of significant interest is the one to Admiral Arthur Philip who was the 1st Governor of New South Wales, Australia. Born at Fulham, England of a German father and an English mother. He served in both the Royal Navy and the Portuguese Navy. The striking memorial to William Bingham (1752-1804) an American senator from Pennsylvania has figures of Angels on each side of the plaque. He has been described as one of the richest men of his time in the Pennsylvania state, having made his fortune through ownership of Privateer’s and commerce, he served as Speaker in its House of Representatives in 1791. There are many hundreds of memorials (640) for the visitor interested in local and national history. 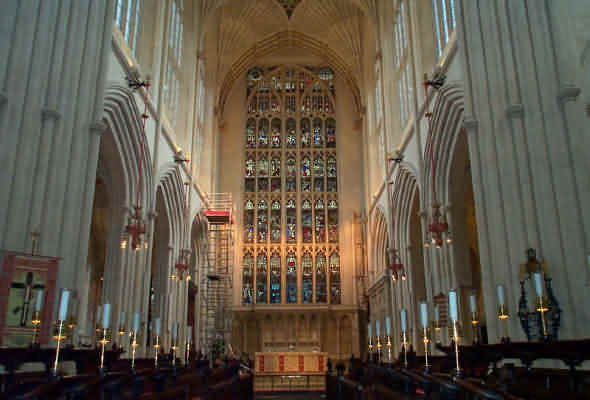 Over the centuries organs in Bath Abbey have stood in various different places in the building. In 1914 Sir Thomas Jackson built a gallery and organ facade in the North Transept for the Norman and Beard organ; it is still thought that this position provides the best compromise between the demands of liturgy and acoustics. 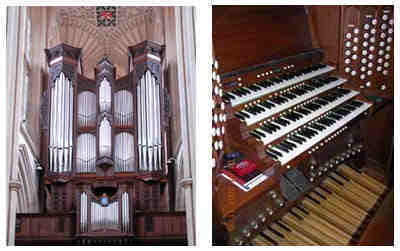 The new Klais Organ (1997) stands on this gallery and the Jackson case, which had already been supplemented by a Positive case designed by Alan Rome (1972), has been raised some 18 inches. Carved fretwork replaces the solid panels either side of the console to allow egress of sound from the Solo division placed immediately behind. The case has also been given a back, sides and roof. Behind the facade the entire structure, action and windchest are new. The organ has mechanical action with electric coupling. Approximately half the pipes are built by Klais and the rest are from builders of earlier instruments (Wm Hill & Son; Norman and Beard; Hill, Norman and Beard). The organ has 4 manuals and pedals and 62 stops. 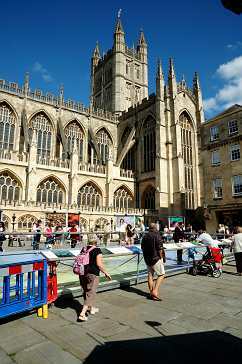 The Friends of Bath Abbey donated a Glockenspiel in 2008.